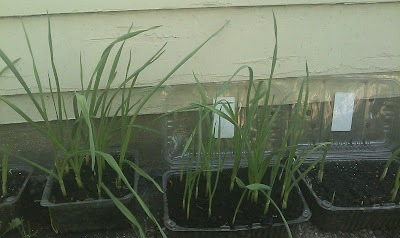 In my limited experiments with growing garlic for consumption as greens, plastic store fruit containers work best. 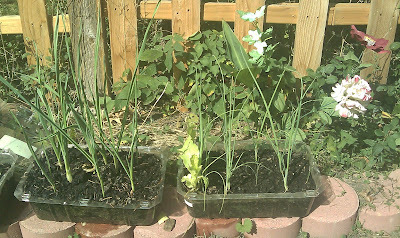 The garlic grows better than in the soil or in raised beds. The method is very easy, simple and inexpensive. It also teaches your children a valuable lesson in recycling and sustainability. 1. Plastic store fruit container. I use grape containers from Costco, $7.99, grapes included. They have a cover and drainage holes. Most other store fruit containers should be fine as long as they are deep enough. 2. Garden soil. Compost and vermiculite are optional. 3. Organic fertilizer such as ground fish. 4. Garlic bulbs. They are available in bulk from Costco, $4.95 per bag. 1. Wash the plastic fruit container. 2. Fill it with garden soil using a trowel. Mix the fertilizer. The mix is better if you can add vermiculite and compost but this is not essential. Water the container. 3. Poke holes with a stick and plant 16 garlic cloves per container. 4. Water daily or every other day depending on the weather. 5. The green garlic is ready for harvest in 15 days.